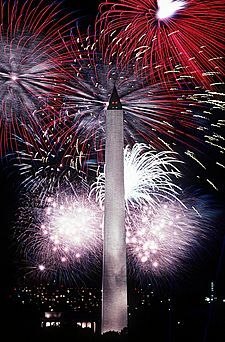 Independence Day, also referred to as the Fourth of July or July Fourth, is a federal holiday in the United States commemorating the adoption of the Declaration of Independence 243 years ago on July 4, 1776. The Continental Congress declared that the thirteen American colonies regarded themselves as a new nation, the United States of America, and were no longer part of the British Empire. 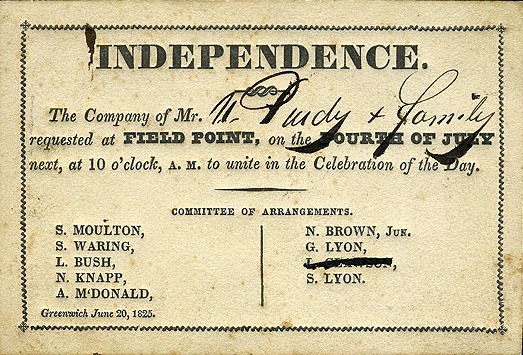 The Congress actually voted to declare independence two days earlier, on July 2. In 1777, thirteen gunshots were fired in salute, once at morning and once again as evening fell, on July 4 in Bristol, Rhode Island. 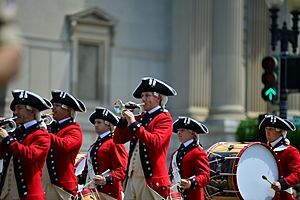 Philadelphia celebrated the first anniversary in a manner a modern American would find quite familiar: an official dinner for the Continental Congress, toasts, 13-gun salutes, speeches, prayers, music, parades, troop reviews, and fireworks. Ships in port were decked with red, white, and blue bunting. In 1783, Moravians in Salem, North Carolina, held a celebration of July 4 with a challenging music program assembled by Johann Friedrich Peter. This work was titled The Psalm of Joy. This is recognized as the first recorded celebration and is still celebrated there today. 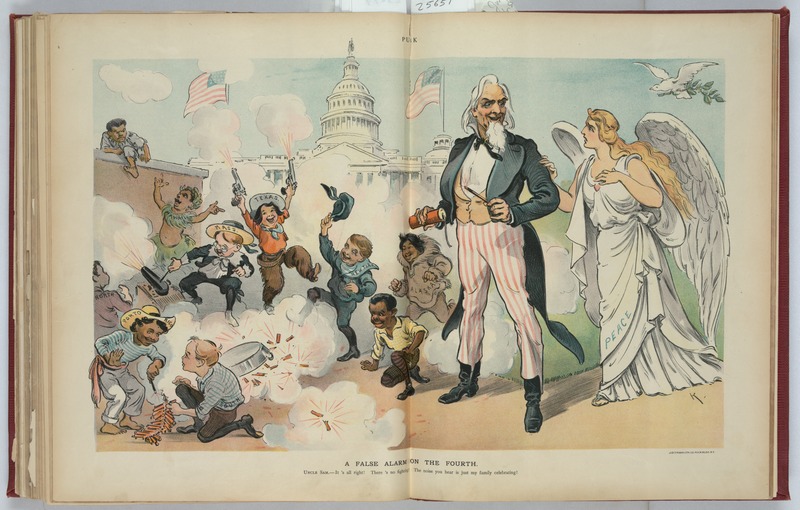 Originally entitled Yankee Doodle, this is one of several versions of a scene painted by A. M. Willard that came to be known as The Spirit of '76. 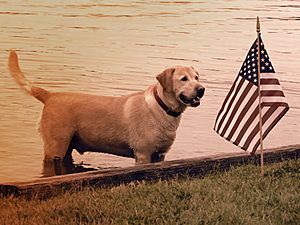 Often imitated or parodied, it is a familiar symbol of American patriotism. 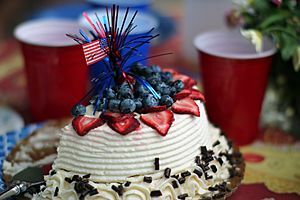 A festively decorated Independence day cake. Lakes are a popular destination for Fourth of July celebrations in the midwest. The night before the Fourth was once the focal point of celebrations, marked by raucous gatherings often incorporating bonfires as their centerpiece. In New England, towns competed to build towering pyramids, assembled from barrels and casks. They were lit at nightfall, to usher in the celebration. The highest were in Salem, Massachusetts, where the tradition of celebratory bonfires had persisted, with pyramids composed of as many as forty tiers of barrels. These made the tallest bonfires ever recorded. The custom flourished in the 19th and 20th centuries, and is still practiced in some New England towns. Independence Day fireworks are often accompanied by patriotic songs such as the national anthem "The Star-Spangled Banner,", "God Bless America,", "America the Beautiful," "My Country, 'Tis of Thee," "This Land Is Your Land," "Stars and Stripes Forever," and, regionally, "Yankee Doodle" in northeastern states and "Dixie" in southern states. 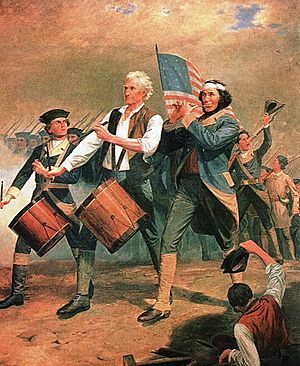 Some of the lyrics recall images of the Revolutionary War or the War of 1812. In 2009, New York City had the largest fireworks display in the country, with more than 22 tons of pyrotechnics exploded. It generally holds displays in the East River. Other major displays are in Chicago on Lake Michigan; in San Diego over Mission Bay; in Boston on the Charles River; in St. Louis on the Mississippi River; in San Francisco over the San Francisco Bay; and on the National Mall in Washington, D.C. Since 1868, Seward, Nebraska has held a celebration on the same town square. In 1979 Seward was designated "America's Official Fourth of July City-Small Town USA" by resolution of Congress. Seward has also been proclaimed "Nebraska's Official Fourth of July City" by Governor James Exon in proclamation. Seward is a town of 6,000 but swells to 40,000+ during the July 4 celebrations. Since 1912, the Rebild Society, a Danish-American friendship organization, has held a July 4 weekend festival that serves as a homecoming for Danish-Americans in the Rebild municipality of Denmark. Since 1959, the International Freedom Festival is jointly held in Detroit, Michigan and Windsor, Ontario during the last week of June each year as a mutual celebration of Independence Day and Canada Day (July 1). It culminates in a large fireworks display over the Detroit River. The famous Macy's fireworks display usually held over the East River in New York City has been televised nationwide on NBC since 1976. In 2009, the fireworks display was returned to the Hudson River for the first time since 2000 to commemorate the 400th anniversary of Henry Hudson's exploration of that river. On the Capitol lawn in Washington, D.C., A Capitol Fourth, a free concert broadcast live by PBS, NPR and the American Forces Network, precedes the fireworks and attracts over half a million people annually. In addition to a fireworks show, Miami, Florida lights Miami Tower with the patriotic red, white and blue on Independence Day. Independence Day (United States) Facts for Kids. Kiddle Encyclopedia.